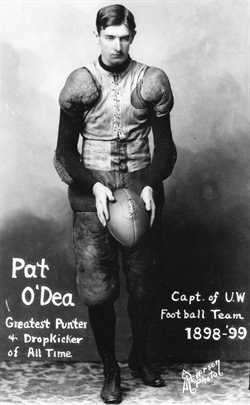 Born in Melbourne, Australia, Pat O’Dea was a star rugby player before his American football kicking fame. Patrick John O’Dea was born March 17, 1872, in Melbourne, Australia. He was a star rugby player for Xavier College, Melbourne. Pat moved to the United States in 1896 and enrolled at the University of Wisconsin, where his brother was track coach. Pat was a member of the crew, a hurdler in track, and four-year football fullback 1896-99. He was famous for his running drop kicks. His longest was 62 yards November 15, 1898, against Northwestern. He made 60- yarders against Chicago, 1897, and Minnesota, 1899. His place kicks included 60 yards against Minnesota, 57 against Illinois, 1899. O’Dea was credited with long punts: 110 yards against Minnesota, 1887, 100 against Yale, 1899, 85 against Lake Forest, 1896. 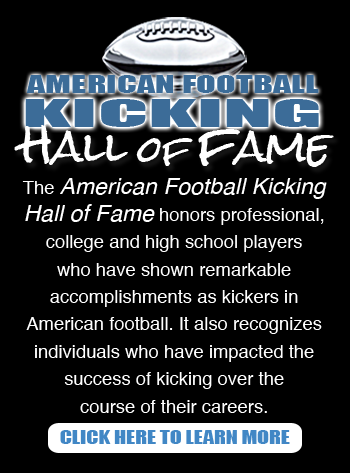 He made a 90-yard run against Beloit, 1899, and in four years made 32 field goals. O’Dea was head coach at Notre Dame 1900-01 (record: 14-4-2) and Missouri 1902 (record: 5-3). He moved to San Francisco and in 1913 coached the Stanford crew. O’Dea disappeared in 1917, was presumed dead, and was discovered in 1934 in Westwood, California, using an assumed name, Clarence Mitchell. “I was tired of the football fame,” he explained. He resumed the name O’Dea. He died March 4, 1962.